The ribbon shelf impresses through its simplicity. «Every piece has a little thing to discover that speaks of the designers’ love for details.» Kaschkasch has done the same for the Ribbon shelf. It’s a free and easy shelf combining the beautiful oak wood and the metal hanging system. Whether you hang only 1 or a dozen, this functional shelf is compatible in so many different interiors due to its accessible look. Available in both white and black. 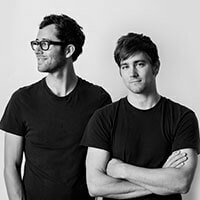 Design duo Florian Kallus and Sebastian Schneider launched design studio Kaschkasch in 2011. With emphasis on furniture, lighting and art direction, Kaschkasch breaks ideas down to their essential elements and creates distinctive pieces that stand between function and elegance. Kaschkasch’s roster of clients include Ligne Roset, Normann Copenhagen, Living Divani and Zeitraum.